Thank you to our Bindaas Member Carrie, for taking the time to share with us her Borrow it Bindaas Experience. Recently I was faced with finding a saree for my friend’s wedding. I procrastinated a bit..well…a lot, because the date kept getting closer and closer and I was still empty handed. I needed a plan, or else I would be showing up underdressed and the stress was getting to me. So on a night close to the wedding date I Googled “rent a saree” and there was Borrow it Bindaas to save the day. Because it was so close, many sarees were booked up but they still had a lot of options available. I was relieved to see that I would still be able to wear something I actually liked which was the Midsummer Dream saree, which I felt was perfect for the occasion! I did like the match your style feature where I could put in the event type and then find what choices were appropriate. I thought it was spectacular that I could get it before my trip started and then send it back after everything for the same set price. I also liked that I got free bindis in the bindaas kit (which I used and shared with many others at the reception). It doesn’t sound like much but it came in super handy! When I used the site it all just came together flawlessly, and a huge weight was lifted from my shoulders. I was a hit at the wedding! My friend’s and I helped each other wrap my saree and get everything all pretty and situated using the draping instructions the BIB team sent in our package. I felt beautiful, and you would never have known about my last minute struggle. Overall I very much enjoyed the experience. 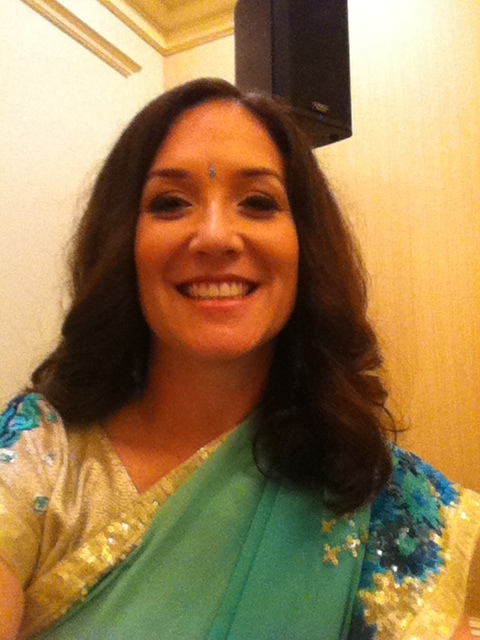 I really liked that the Saree came with two blouses. Some other places I browsed looked cheaper but then when you added in all the stuff they make you buy, they really weren’t. With Borrow it Bindaas you received a full package deal, no hidden charges. Just everything up front and easy. My bindaas kit wasn’t included originally (I think because they rushed it for me) but the customer service ladies were super responsive and sent one out ahead of my arrival at the wedding. When faced with a problem they handled it swiftly and professionally, so I really appreciated that. Thank you Borrow it Bindaas for saving the day! Be renting from you again soon!